“The fearful…shall have their part in the lake which burneth with fire and brimstone” (Revelation 21:8). 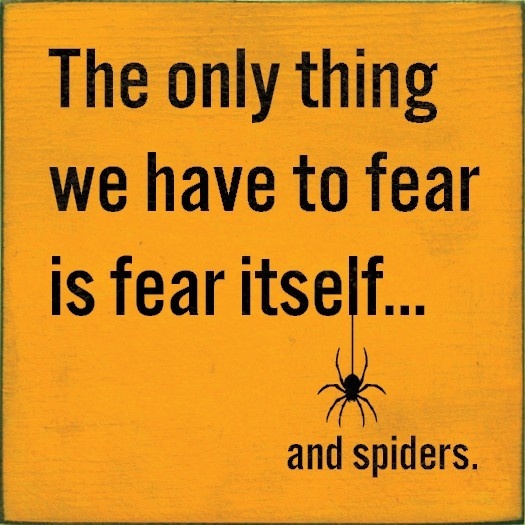 Of course, there are fears, and then there are phobias. Arachnaphobia is fear of those 8-legged critters. Some of the newsworthy phobias of late are homophobia (fear of homosexuals), or xenophobia (strong dislike [fear] of anything different or foreign). These are really emotionally-charged labels used for political purposes, more than the description of an actual fear. A true phobia is different than your average fear. It is usually irrational, exaggerated, and crippling to the person who experiences it. A healthy fear respects a spider’s venom (like the Black Widow, or Brown Recluse) and takes precaution. A phobia causes someone to set it ablaze with a MacGuyvered blowtorch made of a lighter and a can of hairspray, or to jump out of a moving vehicle with your child still in it, as one woman did recently (some of you are asking, “and what’s wrong with that?”). Fear is part of our God-given, emotional nature. It is intended for our good. It keeps (some of) us from doing stupid or hurtful things (sometimes). It might be defined as a healthy respect. We should fear – have a healthy respect for – a brown recluse spider’s venom, for example. So why is fear painted so negatively by the Lord? Or perhaps a better question is, who are the “fearful” people that will be cast from God’s presence for eternity? Let’s back up and look at three phrases in this context. First, Jesus said, “I will give unto him that is athirst” (Revelation 21:6). Thirst is a metaphor for spiritual desire (see: Matthew 5:6). We must have a strong desire for the things of God. As if we were dying of thirst, we must long for spiritual nourishment, and he will provide. Second, Jesus said, “He that overcometh shall inherit all things” (Revelation 21:7). This phrase indicates what happens when we confront God’s spiritual nourishment through the Word. We must overcome self by submission to God’s will. Our lives must change. We must be moldable, or meek, as Jesus said in Matthew 5:5. Finally, Jesus said, “But the fearful” (Revelation 21:8). This is said in contrast to “He that overcometh.” The opposite of the person who overcomes is the person who is fearful. So what does he fear? He fears the consequences of his repentance from sin. He fears conforming to God’s word. He fears what people will think of him. He fears giving up worldly things and friends. Rather than overcoming sin through God’s word, he succumbs to his own feelings, and the pressures of the world around him. He is afraid of the cost. You can be afraid of spiders and still go to heaven, but you can’t be afraid to let God change and direct your life (Proverbs 3:5-6). Next Next post: Love is in the air … or maybe not?